(Moscow Times – themoscowtimes.com – Andrew McChesney – September 25, 2013) People should focus on Vladimir Putin’s work as president and avoid prying into his personal life ­ not that he has one because he is so busy with his Kremlin duties, Putin’s spokesman Dmitry Peskov said. Putin has long kept a veil of secrecy over his personal life. Thus he startled the world with an abrupt announcement on state television in June that he was divorcing his wife, Lyudmila, after 29 years of marriage. The news revived long-running speculation that the 60-year-old president was seeing another woman, possibly the 30-year-old Kabaeva, a State Duma deputy with United Russia and one of the most decorated gymnasts in the history of rhythmic gymnastics. Peskov, complaining that this was the “100th time” that a rumor had started about Putin and Kabaeva, denied that the two had secretly wed Saturday at the 17th-century Iversky Monastery in the town of Valdai, where Putin had attended a forum of Russia experts on Thursday. The speculation apparently began when Twitter user @akaloy wrote Saturday: “I’ve been told that Putin and Kabaeva got married today at the Iversky monastery. All of Valdai is cordoned off.” Opposition leader Alexei Navany retweeted the message to his more than 400,000 followers, and a heated discussion erupted on the Internet. Turning to the 2018 presidential election, Peskov said it was to soon to discuss Putin’s plans and whether he might back a bid by First Deputy Prime Minister Igor Shuvalov, Defense Minister Sergei Shoigu or Mayor Sergei Sobyanin. A Russia expert suggested at the Valdai forum last week that those three officials, all allies of Putin, might be Putin’s main rivals for the Kremlin. Putin himself told the forum that he “did not rule out” the possibility that he might run again. * Putin is willing to meet Yevgeny Roizman, the opposition candidate who won a surprise upset in the mayoral election in Yekaterinburg earlier this month. “As far as I remember, the president very rarely meets with mayors. 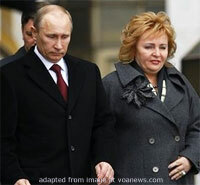 As a rule, when it comes to communication with regional capitals, he contacts the governors,” Peskov said. But, he said, Putin is “not allergic” to Roizman and is ready to meet him as needed, either in a one-on-one setting or at a regular meeting with mayors.